Three of the most famous attractions in Paris on a unique tour you can enjoy in English! Spend the day visiting some of the most beautiful Paris attractions accompanied by a guide who speaks your language. Visit the Louvre Museum and the marvellous works of art that are gathered together inside. Hop on board the small train and reach the highest point of the celebrated area of the city for artists, Montmartre. Let yourself be driven along on a comfortable bus on your voyage of discovery of the French capital and spend a whole day exploring unforgettable places such as the Panthéon, the Latin Quarter, the cathedral of Notre Dame, the River Seine, the area around Montmartre, the Louvre Museum and more. The guided tour of the "Unmissable" sights of Paris has been organised in different stages that have been conscientiously designed to guarantee a deeper knowledge of the different neighbourhoods and the most famous monuments in the French capital. The first stage of the tour in English is on board an air conditioned bus on a voyage of discovery that takes in the famous Place de la Bastille, a significant place historically with regard to the French Revolution. This is followed by passing through the Le Marais district en route to the Latin Quarter where you can admire the stunning buildings of the Sorbonne University and the Panthéon. Then, as you move in the direction of the neighbourhood of Saint-Germain-des-Prés, you will see the numerous luxury shops and famous bars, the Café de Flore and the Café les Deux Magots. 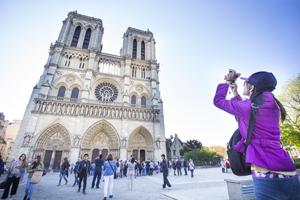 Arriving on the small island known as Île de la Cité, you will have the chance to visit both the outside and the inside of the Cathedral of Notre Dame in the company of your guide. Once you have finished your visit to this temple of gothic architecture, Notre Dame, the guide will accompany you to the river boat from which you will be able to admire the beauties of Paris alongside the riverbanks of the Seine. After a short break to have something to eat, the afternoon's excursion continues with a visit to the neighbourhood of Montmartre. The guide will be able to relate the history of this part of Paris and once you get on board the small train which will take you to the highest point, you will be both amazed and enchanted by the white splendour of the famous Basilica of the Sacré-Cœur. At this point in the day, you will be ready to get to the third most visited museum in the world, the Louvre. Once you are inside the museum, your guide will explain to you in detail about the most famous works such as: the Venus de Milo, the Mona Lisa and the Coronation of Napoléon. English speaking Tour available throughout the year.